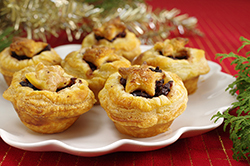 Thanks to readily available frozen puff pastry, these tasty appetizers are easy to assemble. We have three different filling below that are lovely when presented together, but certainly each beautiful and delicious on their own. Try one or all of them! 1. Melt the butter in a medium skillet. Add the crushed garlic and stir for 30 seconds until fragrant, but not browned. Add the spinach. Allow the spinach to cook until defrosted and any water is steamed away. 2. 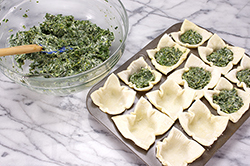 Remove the spinach from heat and allow to cool to room temperature. 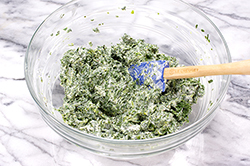 Mix the spinach, mayonnaise and Parmesan together. Chill until ready to fill the puffs. 3. 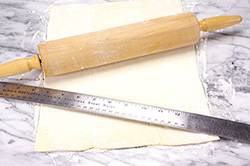 Roll the defrosted, yet chilled, puff pastry to 10” x 14” for the right thickness. 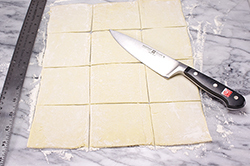 With a knife cut the rolled puff pastry sheet into 12 squares, 2.5-inches each. 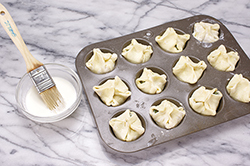 Place each square in the cup of a mini-muffin tin. Pat into place. 4. 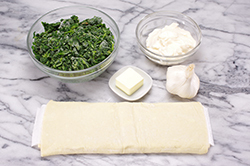 Place a scant tablespoon of the spinach filling into the center of each pastry square. Brush the edges with cream. 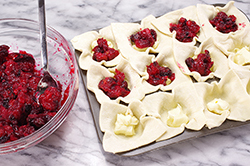 Pinch the four corners of puff pastry together. Brush the closed tops with cream. 5. Bake in a 400°F oven for 20-25 minutes until the pastry is nicely golden brown. 1. 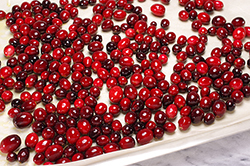 Rinse and pick over the fresh cranberries. Pat dry. 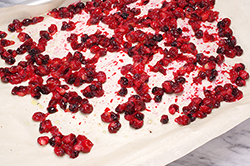 Toss with the olive oil and roast in a 400° oven on a rimmed sheet until the cranberries have popped and wilted, about 6-8 minutes. 2. 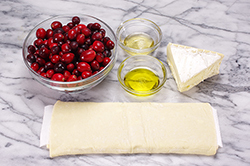 Transfer the roasted cranberries to a bowl including any juices. Drizzle with the honey. Cool. 4. Place a teaspoon-sized piece of brie in each cup. 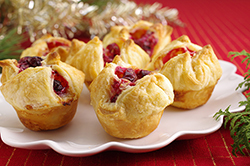 Top with a teaspoon of the cranberry sauce. 1. 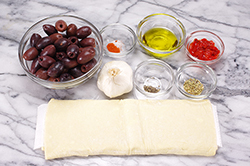 Chop the drained, pitted Kalamata olives to a fine texture. Place in a small bowl. Add the remaining ingredients and stir well to combine. 2. 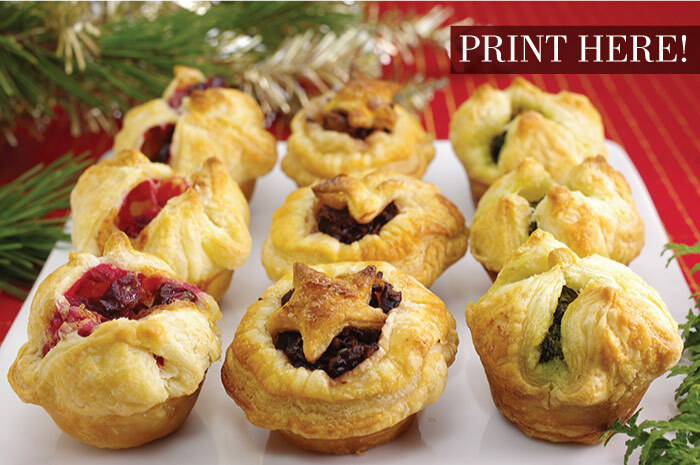 Roll the defrosted, yet chilled puff pastry to 10” x 14” for the right thickness. With a round biscuit cut 2.5” circles. 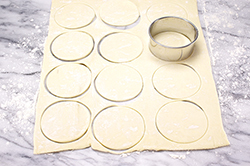 Place each circle in the cup of a mini-muffin tin. Pat into place. 3. 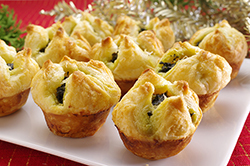 Place about one tablespoon of the olive mixture in the center of each pastry circle. 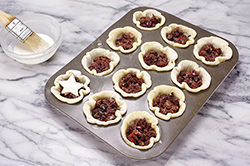 Optionally top with a cut-out – we used a small star – from the pastry scraps. 4. Bake in a 400°F oven for 20-25 minutes until the pastry is nicely golden brown.